SPEDISCO IN TUTTO IL MONDO CHIEDIMI IL PREZZO. Jacot tool watch pivot repair tool tour a pivoter antique old lathe. X TORNIO DA OROLOGIAIO LATHE. manopola con albero filettato. Banker's draft. TORNIO antico ( arriva quello in foto ). UTENSILERIA PER OROLOGIAI VENDO PER INUTILIZZO. per Italia per contrassegni CONTATTATECI PER QUALSIASI INFORMAZIONE. 0733/232603 cell. con aggiunzione di prezzo. We have for sale this excellent Swiss made Jacot tool. Perfect working condition, ready to be used. This tool is in excellent condition. The quality is superb, with beautiful perlage finish. Very complete set, supplied with 3 runners, 2 lantern end runners, and a pivot gauge. Boley & Leinen "REFORM". Wax chuck - and full set of numbered STEP COLLETS. There are TWO lathe mounting "FEET" neither of which are the correct size for the lathe. Nice quality lathe by this highly prized maker. 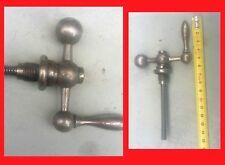 This is a top quality tool and is 100% fully functional in great condition, the thread should however be replaced. This is one of the easiest ways of working with a Jacot tool as you won't need a bow, however you still can if you wish to. The Burnerd. Model 32 ~ 3 Jaw Chuck with 6 mm fitting for Watchmakers - Jewellers Lathe. Keyless and self centering chuck. Wolf Jahn & Co Frankfurt Germany. To fit 20mm D Bar. Tornio SHIRLINE 1100. ENTRO i 30 Kg. Dopo aver avuto delle prolematiche con utenti. You also get the two spare discs with holes in them. If you look after this tool it can be passed on and used for genereations. Pultra 10 orologiai TORNIO 8mm in scatola GIRA Strumento Rest & collets. 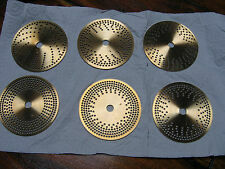 SWISS MADE BY WIT WATCHMAKERS WATCH BRACELET FILING BLOCK MADE FROM BRASS. LOCATION BOTTOM. THE BOX IS ORIGINAL. This is an original antique watchmakers or clockmakers lathe turning tool in great condition with superb patina to the steel and brass Measurements - measures 7 inch long in total x 3 inches high x 2.75 inches deep Maker - English Date - 19thc. B.T.M. orologiai TORNIO 8mm con scivolo composto GAP TORNIO letto collets ecc. EVERYTHING THATS SHOWN IN THE PHOTOS. THE DRAWBAR FITS BUT IS NOT THE ORIGINAL HAS IT'S HAD A BRASS SPACER FITTED, THERE IS A GOOD SELECTION OF COLLETS HAS SHOWN. SWISS MADE BY WIT WATCHMAKERS WATCH BRACELET FILING BLOCK MADE FROM BRASS. RARISSIMO MUSEALE ATTREZZO PER TORNIO OROLOGIAIO. ben tenuto OTTONE MASSICCIO OROLOGIAIO DELLEPOCA, SI PUO LUCIDARE E DVENTA DI UN BEL COLORE DELL'ORO. A MANOVELLA 1830. Wolf Jahn & Co Frankfurt Germany. All parts are free and smooth moving with no play in bearings. Wolf Jahn & Co 6mm shaft collets ~ No's 2x6 2x8 10 12 14 16 18 20 22. CC with 6mm shaft collets ~ No,s 22 24 26 28 30 32 34 36 40. This is a beautiful tool and everything is original, it was only bought for the watchmaker's exam and hasn't been used since! It has had minimal usage (if any). Leinen manufactured them to fit either their WW80/81 lathe OR their WW82/83 lathe (see picture). As far as I know they were identical except for the mounting bracket and possibly the length of the drawbar. JACOT tool. Is marked SWISS made. A boxed set with accessories. Hence this is sold WITHOUT RESERVE!